Welcome Home to Skyview Ranch, one of Calgary?s most desirable new communities. 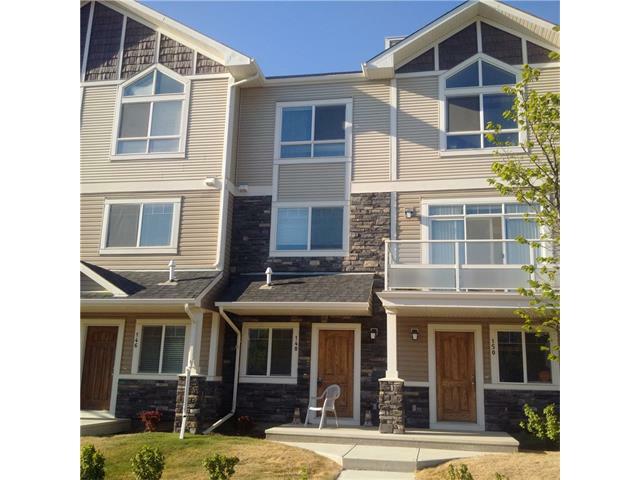 This modern 3 storey townhome is located in the ARRIVE Condos - a certified Green Built complex. Features include: a bright, open concept floor plan with laminate & lino flooring, perfect for those with allergies looking to create a hypoallergenic home, a spacious living room, 9 foot ceilings, an open dining area and kitchen with water line to the fridge, plenty of counter space and ceiling fans throughout. Step out from the patio doors to your private balcony with glass railings and gas line for a BBQ. Upstairs you?ll find two generous sized bedrooms including the master suite with a 4 piece private en-suite and walk-in closet. The lower level is also fully developed including a 2 piece bath and family/flex room. With easy access to Metis, Stoney & Deerfoot Trails, just minutes away from the Airport and Cross Iron Mills, come and see for yourself all that Skyview Ranch has to offer. Call today to arrange your private viewing. This property is listed by Real Estate Professionals Inc and provided here courtesy of Kamal Jain. For more information or to schedule a viewing please contact Kamal Jain.